As many as 6,200 potentially hazardous asteroids (PHAs) are orbiting close to Earth, a new survey by Nasa has revealed. The PHAs are considered robust enough to survive the passage through Earth's atmosphere. If they were to collide with Earth they could cause damage on a large scale, experts warn. In the most detailed study of PHAs yet researchers used infrared scans from Nasa’s 16-inch WISE telescope to identify 4,700 asteroids – plus or minus 1500 – that come within five million miles of Earth’s orbit. An image released by Nasa shows the distribution of the PHAs - with every orange dot representing an asteroid measuring 330 feet (100 metres) or more that is in orbit. Only 20% to 30% of these objects have previously been charted. Although there is no cause for immediate alarm, Nasa said the information could prepare us for future disasters. 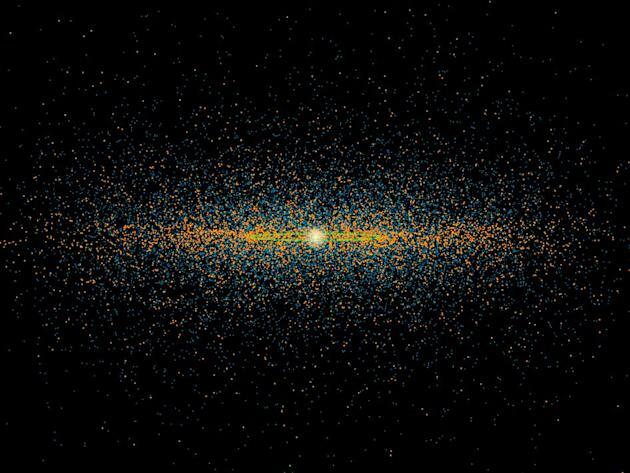 Lindley Johnson, programme scientist for the Near-Earth Object Observation said: “The NEOWISE analysis shows us we've made a good start at finding those objects that truly represent an impact hazard to Earth. Amy Mainzer, NEOWISE principal investigator, at NASA's Jet Propulsion Laboratory in California added: “It turned out to be a huge bonus. “Everything we can learn about these objects helps us understand their origins and fate. Our team was surprised to find the overabundance of low-inclination PHAs.